I love baked beans and the most likely type a Russian kid growing up in Australia in the 1970’s would have eaten was Heinz. I remember the jingle “Beanz Meanz Heinz” with some fondness as the TV ads gave me a sense of what it was like to be an Aussie kid, albeit one growing up a very Russian home environment. The other type of baked bean I ate as a kid was the Greek variety. I often go on about how much I love Greek cuisine and some of my earliest memories of food that truly excited me was Greek. 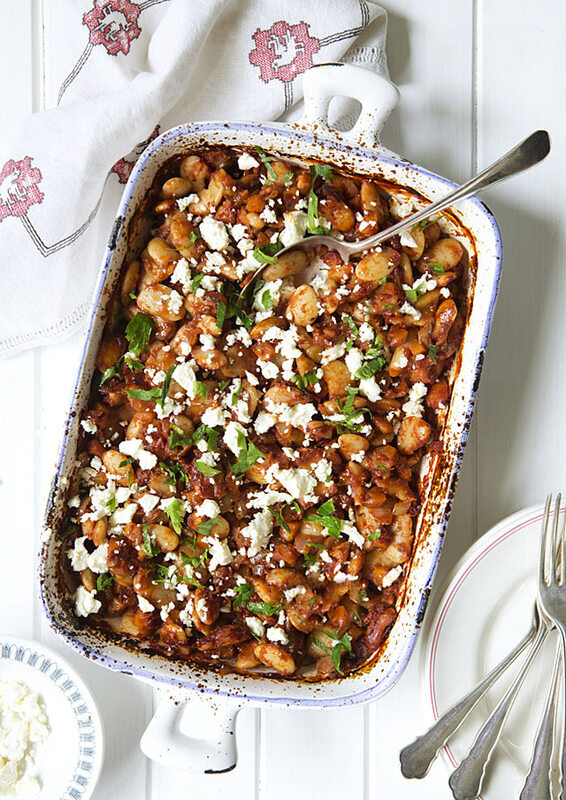 Enter Gigantes Plaki, the Greek Baked Bean, which in my opinion is a true wonder of a bean dish. I ate it mostly in the tinned form which I’d buy on shopping expeditions from the Greek deli’s in the Melbourne suburb of Oakleigh. (I would accompany my mother who made regular trips out there to buy huge tins of olive oil, bags of flour and all manner of continental delights.) I would also occasionally order the beans at a Greek taverna where they would make up part of a mezze spread, sitting happily alongside tzatziki, taramasalata, dolmades and other Grecian favourites of mine. The Greeks love their giant white bean, the fasolia gigante, which is the main ingredient in the dish I’m featuring this week. The dry variety of fasolia gigante can be difficult to find in Australia, so if you’re in the same boat as me, use the largest Lima beans you can find. If you can find the bean then it’s a bonus because the dish is intended to be made with them, (the fasolia gigante species of bean is native to Greece). My version of Gigantes Plaki is sweetened with maple syrup rather than the honey found in some original versions. The maple syrup lifts the flavours in the sauce and creates an interesting and delicious blend of salty and sweet. A highlight of this dish is the top layer of beans, which become caramelised and crisp after having spent over an hour baking. My version also includes bacon which adds an amazing subtle smoky flavour, however if you prefer to make a vegetarian version it is also delicious without. The dish can be eaten hot or cold (like many European cooked vegetable dishes often referred to as “salads”) and can be eaten at any time of the day. Eat it with eggs for breakfast, some bread for lunch, and throw a salad alongside it for dinner. Whilst you’re at it, crumble a little fetta over the beans for a truly delightful meal. Prep time: 45 minutes. Cooking time: approximately 2 hours. Serves four as a main meal or six as a side. 2. Preheat oven to 170˚C (approx. 338˚F). 3. Heat a heavy bottomed pan over medium to high heat, add the olive oil and fry the onion and bacon until the onion is soft and translucent. Add the carrot, celery and garlic cooking for a further ten minutes until the carrot is soft. Stir in the tomato passata, oregano, cinnamon, salt and pepper. Bring to a boil then lower heat and simmer for ten minutes. 4. Combine the cooked beans with the tomato sauce (I pour the drained beans straight into the pan with the sauce). Pour the wonderfully saucy beans into a greased baking dish (give the dish a spray with olive oil) and bake for one and a quarter hours. If you find the sauce drying out too much you can add a little water half way during the cooking process. Bear in mind the tops of the beans are meant to be a little charred and caramelised as this is part of the charm of the dish. 5. 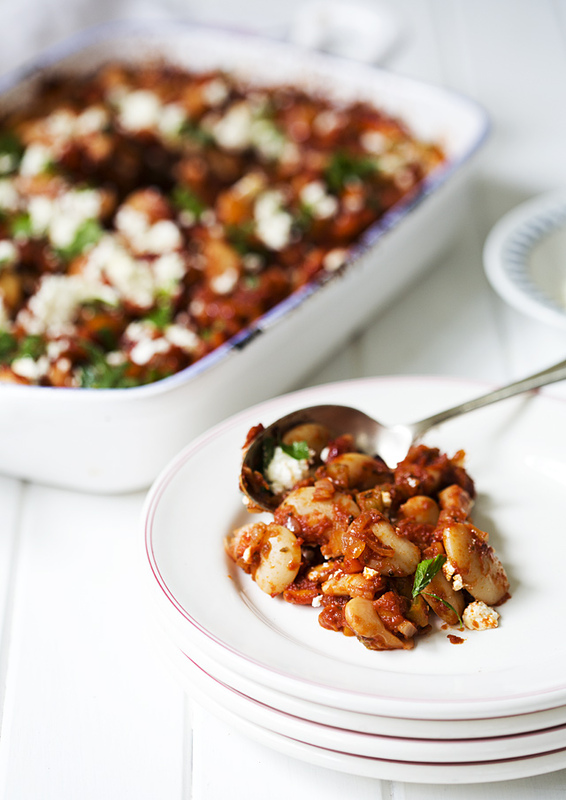 Scatter over the fetta cheese and chopped parsley. I suppose it’s clichéd but you can’t beat light and white for Greek food and it takes me back to my own travels in Santorini Greece where everything is awash in white and blue. I’ve used a baking dish by Virginia Casa which is ironically made to look like a beaten up old enamelled baker complete with chips all over it. (It is in fact ceramic!) The plates, little bowl and forks are vintage English pieces and came from our local charity shop Vinnie’s. The vintage piece of linen is Eastern European (I’m not sure where it came from, it might be a family piece). The background is a piece of wooden wall panelling I rescued out of the trash and painted white. The only light used in this image is daylight. For Aussie kids of the 70’s and 80’s wanting to take a trip down memory lane, here is a Heinz baked beans ad on YouTube which made me smile. These look amazing. I love beans and Greek food! I will book mark this recipe and look for this variety online. I can’t find Lima beans anywhere! Is there another legume I can use to replace it? If I don’t have time to soak dry beans, would canned work? Would I still have to boil them, or would they be good to start with step 2?